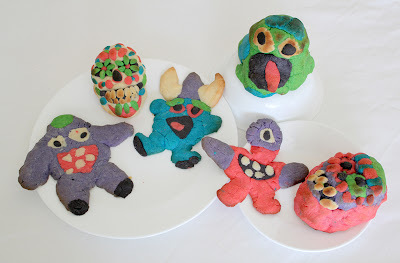 I've just written up a little Halloween project over at Alpha Mom about using cookie dough as playdough and baking it into nomable 3D monster and skull cookie sculptures. We had a lot of fun doing this one and as you can probably tell, it's not something that you have to limit to Halloween. You can make any cookie your imagination can invent with this technique. I'm quite tempted to get a bunch more dough made and make a cookie solar system or a cookie self portraits. Endless possibilities and when you've got more than one kid and only one rolling pin and hardly any cookie cutters, this is a great alternative to conventional cookie baking! so pop over to Alpha Mom to read more and see some more photos too. 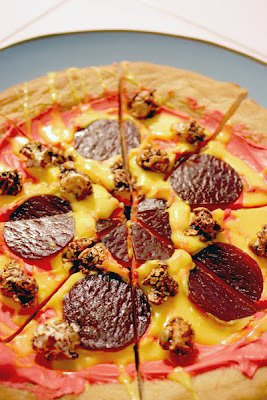 We have had fun with cookie dough and food colouring in the past here as well, making giant cookies and pizza cookie here, plus candy cane cookies last year and cookies that you could lace with too. Hope you've all got your Halloween costumes ready. We haven't! Carys only told me a couple of days ago that she wants to be Miss Frizzle from The Magic School Bus series of books, which I think is a totally awesome choice, but does mean that I need to do some sewing over the next week. At least the princess dress that Ffion wants to wear just needs the length altering. Any ideas for a really easy baby costume for Delyth? I thought maybe I could make her a lizard costume, so she could be either Liz to Carys's Miss Frizzle, or Pascal to Ffion's Rapunzel, but that seems like a lot of work right now! If she's still small enough to wear a babygro (all in one sleepsuit with arms and legs and usually poppers up the middle), and you have a spare plain white one, you could either sew bandages all over to make a mummy or use some fabric paint to draw a skeleton on it. Or if you have a spare dark coloured one, you could use glow in the dark fabric paint. My son wants to be a Stormtrooper, thanks to me opening my big mouth...I don't even know if we can buy those big plastic milk jugs in Canada...should have looked into that before I mentioned it. My daughter, who until now wanted to be a pirate, wants to be a ballerina now which poses the cold-weather issue...a tutu over longjohns? A Canadian ballerina! Two year old wants to be a princess which is easy...sigh. 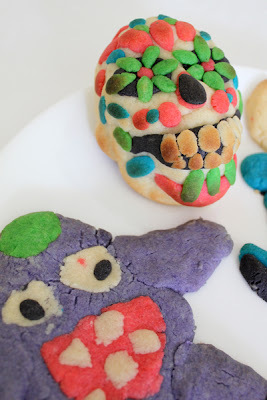 So, no, no costumes ready, but am definitely going to do these cookies! They're awesome! I vote for Ms. Frizzle's space outfit! Del does have a pale green sleepsuit, so I'm going to take the advice up top and use that with some lizardish accessories for her. These are fabulous! So creative!